"PC-12" redirects here. For other uses, see PC12 (disambiguation). The Pilatus PC-12 is a single-engine turboprop passenger and cargo aircraft manufactured by Pilatus Aircraft of Stans, Switzerland since 1991. The main market for the aircraft is corporate transport and regional airliner operators. The PC-12 is the best-selling pressurized single-engine turbine-powered aircraft in the world and has been for several consecutive years, with 1,500 deliveries as of June 2017. In October 1989, Pilatus announced the development of the PC-12 at the annual convention of the National Business Aviation Association (NBAA). :80 Prior to the 1989 announcement, the PC-12 project had been worked on for some time under high levels of secrecy; by the time of the announcement, assembly of the first prototype had already commenced. :81–82 Pilatus believed that the PC-12 would fit a new market not served by existing aircraft, and that the type would be the first single-engine aircraft capable of a large volume at high speed across long distances. :82 The two prototypes were completed on 1 May 1991, with the first flight taking place on 31 May 1991. Swiss certification of the type had been originally planned for mid-1991;:81 however, a redesign of the wings (increase of wingspan and addition of winglets to ensure performance guarantees were met) delayed progress. On 30 March 1994, the Swiss Federal Office of Civil Aviation issued the type certificate for the PC-12; Federal Aviation Administration approval in the U.S. followed on 15 July 1994. Since entering service, Pilatus developed a large number of improvements and options upon the original PC-12 model; amongst these changes include increases in the maximum takeoff weight, the use of increasingly powerful engines, the adoption of new avionics, noise-reduction measures, new propellers, speed and range increases, additional interiors, and new inflight entertainment systems. Other aviation firms, such as Finoff Aviation Products, have also produced their own independent products and aftermarket enhancement packages for the PC-12. Pilatus announced the PC-12NG (Next Generation) at the 2006 NBAA meeting in Orlando, and officially launched it during the NBAA 2007 in Atlanta. The NG features a more powerful Pratt & Whitney PT6A-67P engine with better climb performance and an increase in maximum cruise speed to 280 knots TAS. The NG also features a Honeywell Primus Apex glass cockpit; prior to this, the PC-12 had been one of the only high end models to lack flat-panel avionics. The revised cockpit includes automatic pressurization control as well as cursor controlled inputs to the navigation system. The PC-12 NG winglets have also been modified from the original version. Within two years of launch, over 200 orders reportedly had been placed for the PC-12 NG. In May 2008, the first PC-12 NG was delivered. The PC-12M (Multipurpose) is based on the PC-12 NG but equipped with a more powerful electrical generation system allows installing additional power-consuming equipment. This enables the PC-12M to perform missions such as flight inspection, air ambulance, aerial photography, and aerial surveillance. An optional utility door accommodates parachute drops of people and cargo. This version is marketed in the United States as the PC-12 Spectre paramilitary special missions platform. On 18 December 2012, Pilatus officially opened its Chinese headquarters in Chongqing Liangjiang and announced that manufacturing of the PC-12 for Asia-Pacific customers would take place on the Chinese production line at this site in the future. In September 2014, it was announced that the production for various aerostructures for the PC-12 NG would be performed by Tata Aircraft Systems in India from 2016 onwards, these parts having previously been manufactured by PZL-Świdnik in Poland. The PC-12 is a single-engine turboprop-powered business aircraft, designed for performing in multiple roles and to deliver equal performance and safety to twin-engine aircraft. It is powered by a single Pratt & Whitney PT6A-67 engine; early models being powered by the PT6A-67B, while the later PC-12 NG variant uses the more powerful PT6A-67P, which is flat rated at only 70% of its maximum power. According to Pilatus, the PC-12 NG has exceptional versatility and is capable of operating within the most rugged environments, such as the Australian outback; it is one of the few pressurized turbine-powered aircraft capable of operating from rough landing strips. A trailing arm landing gear arrangement is used to enable the PC-12 to access thousands of airfields that most jet aircraft would be incapable of using. The cabin interior of the PC-12 can accommodate up to nine passengers in a comfortable configuration, which includes features such as a refreshment centre, a fully enclosed lavatory, and a baggage area to the rear of the cabin. Other cabin configurations include executive arrangements, seating between six and eight passengers, a four-seat passenger-cargo combi layout, and an air ambulance setup housing two litters and three attending medics. The interior was designed in conjunction with BMW's Designworks division, making extensive use of leather, fine wood veneers and various textiles to create an environment deliberately akin to a luxury road vehicle. An atypically large cargo door is installed to accommodate more bulky items, including palletised cargo. The PC-12 incorporates numerous safety measures. The PT6A-67 engine has a reputation for considerable reliability, a factor that has reportedly been decisive to some prospective operators. To counteract stall and spin conditions, dual angle-of-attack sensors near the wingtips force the stick forwards in advance of a potential stall. For greater redundancy, the PC-12 NG has a complete split-bus dual electrical system as akin to modern jet aircraft, in addition to two separate batteries and a third emergency battery. The type is certified for flight into known ice conditions; as per standard fit, pneumatic de-icing systems are installed in the wings and empennage, while electrical de-icing measures are integrated into the windshield and exhaust heat is used for engine inlet de-icing. :84 Aviation Week describe the PC-12 as possessing "...comparatively slow take-off and landing speeds, excellent short-field performance, and easy handling characteristics." In addition to its uses as a passenger transport and private aircraft, the PC-12 can be configured as a multi-mission platform, such as an air ambulance or for conducting surveillance aircraft missions. In the latter role, a retractable Electro-optical/Infrared sensor may be installed into the aircraft's tail and an operator's console, containing two display monitors, a digital video recorder, communications panel, and expansion bays to accommodate various radios and datalinks, can be fitted in the main cabin area; the aircraft may be highly customized to meet customer's specific mission requirements. In the multi-mission capacity, the type has seen use by various customers, including the Red Cross, the Royal Flying Doctor Service of Australia, the Royal Canadian Mounted Police, and the United States Air Force, among others. The type features a three-axis autopilot as standard, while weather radar, long-range navigation systems and radar altimeter are optional. :84 The flight deck of the PC-12 NG is equipped with Honeywell's Primus Apex avionics system, consisting of four 10-inch high-resolution liquid crystal display screens, two of which perform as the primary flight displays directly forward of either pilot, the other two being multi-function displays in a central position between the two pilots. The Apex system shares many similarities to the flight decks of other business jets and has been designed to minimize crew workload and provide for improved safety during single-pilot operations. An advanced synthetic vision system, delivering greater situational awareness and safety during visual flight rules (VFR) flight, is also present. The cockpit's layout is optimized for ergonomic and aesthetic appeal, providing similar comfort levels for the flight crew as to the passengers. An engine condition monitoring system is present on the PC-12 NG, automatically monitoring engine parameters and producing relevant warnings, easing preventive maintenance efforts. At a weight of 9,200 lb (4,200 kg), FL210 and ISA+5°C, it cruises at 271 kn (502 km/h) TAS with a fuel flow of 464 lb (210 kg) per hour, 5 kn (9.3 km/h) slower than book speed when battling a sinking mountain wave to stay level. Early sales of the PC-12 principally went to utility operators, reportedly Pilatus were uncertain of the sales potential for the aircraft to business and passenger operators early on. In 1994, the Royal Flying Doctor Service of Australia became the launch customer of the PC-12. It operates 32 PC-12s throughout Australia to deliver medical services in remote areas. In 2003, US charter airline Tradewind Aviation started operating the PC-12, which has now grown into one of the country's largest operators of the type, with 22 aircraft. In 2006, the magazine Flying referred to the PC-12 as "...more economical to operate than any turbine airplane of similar size." 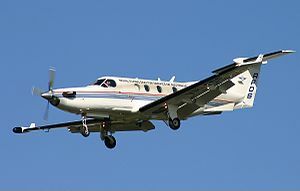 In 2007, Flying magazine described the high rate of value retention on used PC-12s as "unbelievable"—attributing this to the popular demand for the type. High oil prices are a prominent sales factor for turboprops, and the PC-12 among them. The bulk of demand comes from North America and three quarters of PC-12NG sales are in executive configurations. While its price grew from $3,270,760 in 2005 to $4,713,275 in 2015, it retains 80-85% of its selling price after 10 years given average use, better than comparable turboprop or business jets and it sells 40% faster. Pilatus also uses a series of overseas distributors to market and sell the PC-12 within designated regions. AMAC Aerospace is the exclusive sales agent for the type within the Middle East. In August 2014, Californian airline Surf Air placed an order for 15 PC-12 NGs and 50 options, one of the largest contract for the type. PlaneSense, a New Hampshire-based fractional ownership company, manages the largest fleet of the type, operating 34 PC-12s in 2015. In June 2010, Pilatus announced that the 1,000th PC-12 had been delivered. By August 2013, the worldwide PC-12 fleet had accumulated a combined total of 4 million flight hours and 1,200 PC-12s had been delivered to customers. Just over a year after the 1300th, the 1400th PC-12 was delivered in July 2016. The fleet has accumulated 5.6 million total flight hours since certification, and 1 million flight hours for the 630 PC-12 NG since its introduction in 2008. As the fleet logged over 6.8 million hours, the maintenance interval was raised from 100/150 hours to 300 and a new maintenance plan reduces labor by 20% to 40% to lower direct operating costs. By 2017, a nine year old PC-12 was worth $2.5-2.8m, and 15-16 years old models had a $1.8m value. Original production variant certified in 1994 has a Pratt & Whitney Canada PT6A-67B engine, 4,100 kg (9,039 lb) maximum takeoff weight, conventional round-dial cockpit, starting at SN101. Variant certified in 2008 has upgraded avionics and a Pratt & Whitney Canada PT6A-67P engine. Sometimes known by its trade name PC-12 NG (Next Generation). United States Air Force designation for the PC-12. As of July 2016[update], 1,400 PC-12s have been delivered. Most are used in the civil market. ^ a b Vogelaar, Rob (30 June 2017). "Pilatus Hands Over 1500th PC-12 to Royal Flying Doctor Service of Australia". aviationnews.eu. Retrieved 2 July 2017. ^ a b c d e f g h i j "PC-12 NG Brochure" (PDF). Pilatus. 15 July 2013. Archived from the original (PDF) on 9 October 2016. ^ a b c d George, Fred (1 February 2014). "Finnoff PC-12 Upgrade". Aviation Week. Retrieved 21 February 2016. ^ "Booming Business." Flight International, 23 September 1989. ^ a b c d e f g Moll, Nigel (November 1989). "A Swiss to Watch". Features. Flying. Vol. 116 no. 11. Diamandis Communications. pp. 80–84. ISSN 0015-4806. Retrieved 21 February 2016 – via Google Books. ^ "PC-12 Makes First Flight". Reporting Points. Flying. Vol. 118 no. 8. Hachette Filipacchi Media U.S. August 1991. p. 20. ISSN 0015-4806. Retrieved 30 June 2016 – via Google Books. ^ "Pilatus PC-12 Certified in Switzerland". Reporting Points. Flying. Vol. 121 no. 7. Hachette Filipacchi Media U.S. July 1994. p. 28. ISSN 0015-4806. Retrieved 21 February 2016 – via Google Books. ^ Federal Aviation Administration (10 November 2015). "Type Certificate Data Sheet No. A78EU" (PDF). Retrieved 1 July 2016. ^ a b c d e f g h McClellan, J. Mac (10 August 2010). "Pilatus PC-12: The Value of Only One Engine". Flying. ^ Grady, Mary. "Pilatus Offers New Upgrades for It's PC-12 NG." Robb Report, 19 March 2014. ^ Marsh, Alton K. (16 November 2015). "Pilatus Boosts PC-12 NG Performance". AOPA. Retrieved 21 February 2016. ^ Sarsfield, Kate (16 November 2015). "NBAA: Pilatus marks flight of second PC-24 and upgrades PC-12NG". Las Vegas: Flightglobal. Retrieved 21 February 2016. ^ "Hartzell Introduces 5-Blade Carbon Fiber Propellers for PC-12 Fleet" (Press release). Las Vegas: Hartzell Propeller. 17 November 2015. Retrieved 21 February 2016. ^ a b c d e McClellan, J. Mac (October 15, 2006). "Cabin Size Really Does Matter". Pilot Reports. Flying. Hachette Filipacchi Media U.S.
^ "Pilatus Receives Excellent Feedback from Honeywell Apex Users" (PDF) (Press release). Stans: Pilatus Aircraft. 6 October 2008. Archived from the original (PDF) on 15 July 2011. Retrieved 14 June 2010 – via pilatusowners.com. ^ a b c d e Goyer, Robert (September 8, 2008). "Next Big Thing: Pilatus PC-12 NG". Pilot Reports. Flying. Hachette Filipacchi Media U.S.
^ O'Keeffe, Niall (24 April 2009). "Finnish Air Force opts for PC-12 liaison fleet". London: Flightglobal. Retrieved 21 February 2016. ^ a b "Pilatus PC-12 Spectre." Archived 2015-02-26 at the Wayback Machine Pilatus Aircraft, Retrieved: 20 February 2016. ^ "Pilatus Aircraft to Set Production Base in Chongqing Liangjiang" (Press release). Chongqing, China. PR Newswire. 24 December 2012. Retrieved 23 February 2016. ^ Wei, Xu. and Tan Yingzi. "Chongqing looking to the skies." Archived 2016-03-03 at the Wayback Machine China Daily, 16 April 2013. ^ Trautvetter, Chad. "Pilatus Taps India's Tata To Make PC-12 Aerostructures" AIN Online, 26 August 2014. Accessed: 4 September 2014. ^ Roa, Nithin. "Batting for defence." Archived 2016-03-06 at the Wayback Machine Tata Group, October 2014. ^ "Pilatus PC-12 Service Bulletin No 25-014, see section 1C(3)." Archived 2012-04-03 at the Wayback Machine Pilatus Aircraft, Retrieved: 6 October 2011. ^ Morrison, Murdo. "NBAA: Pilatus shows special mission Spectre PC-12." Flight International, 11 October 2011. ^ Fred George (Apr 27, 2016). "Pilot Report: Pilatus PC-12 NG Faster and farther, more capable and more comfortable". Business & Commercial Aviation. ^ "Our Fleet". Royal Flying Doctor Service of Australia. ^ McClellan, J. Mac (September 5, 2007). "Best Used Turboprops". Pilot Reports. Flying. Hachette Filipacchi Media U.S.
^ Sobie, Brendan (9 October 2008). "High oil prices lead to surge in executive turboprops". Flight International. ^ Sarsfield, Kate (4 May 2009). "Singles continue to propel". Flight International. ^ Sarsfield, Kate (8 May 2012). "Business jet manufacturers turn a corner". Flight International. ^ "Pilatus PC-12: Enduring Value" (PDF). Rolland Vincent Associates. January 2016. ^ Mathews, Neelam (15 May 2012). "Amac Opens Istanbul Facility, Prepares for PC-12 Sales". Aviation International News. ^ Sarsfield, Kate (11 December 2012). "MEBA: AMAC and Pilatus join forces to promote PC-12 in Middle East". Dubai: Flightglobal. ^ Sarsfield, Kate (18 August 2014). "Surf Air acquires up to 65 PC-12NGs for members only airline". London: Flightglobal. ^ "Fractional aircraft ownership that make sense". PlaneSense. ^ Patiky, Mark (August 15, 2015). "Fractional Profile: PlaneSense Takes A Unique Heading". Aviation International News. ^ "Pilatus Delivers the 1000th PC-12" (PDF) (Press release). Pilatus Aircraft. 15 July 2010. Archived from the original (PDF) on 16 June 2011. ^ "Pilatus delivers 1200th PC-12". Skies Magazine. 13 August 2013. ^ a b "Pilatus Delivers 1400th PC-12 and Achieves Major Flight Time Milestone" (Press release). Pilatus. 5 July 2016. ^ Ian Sheppard (May 29, 2018). "Pilatus PC-12 Mx Intervals Extended". Aviation International News. ^ "The Costs to Own and Operate a Pilatus PC12". SherpaReport. 29 September 2017. ^ "New Special Ops PC-12 Unit." AirForces Monthly, Issue 269, September 2010, p. 21. ^ Gerzanics, Mike (6 June 2016). "Upgraded Pilatus PC-12 powers ahead". Denver: Flightglobal. Retrieved 6 June 2016. ^ "PC-12 NG Just The Facts" (PDF). Pilatus. 20 October 2015. Archived from the original (PDF) on 9 October 2016. ^ Lednicer, David (2010). "The Incomplete Guide to Airfoil Usage". Retrieved 30 November 2018. "FLIGHT TEST: Pilatus PC-12NG". Flight Global. 12 May 2008. "Type Certificate Data Sheet A.089, Issue 04" (PDF). European Aviation Safety Agency. 4 November 2009. "Pilatus bounds ahead". Flight International. 19 April 2011. Goyer, Robert (June 25, 2013). "PC-12 Versus the World". Flying. Bonnier Corporation. Sarsfield, Kate (11 February 2014). "Pilatus introduces enhancements to PC-12 NG". Flightglobal. London. Fred George (Apr 27, 2016). "Pilot Report: Pilatus PC-12 NG Faster and farther, more capable and more comfortable". Business & Commercial Aviation.